To easily add a Drape Support Rod along any portion of a "U" shape set-up (or fully enclosed booth), or to divide a back wall in to a "T" shape set-up without the need for a middle (center) Upright & Base, our Shelf Hangers are a great option! Easily create a beautifully layered drape look for your pipe and drape display with our Valance Hangers! For weddings and backdrops, you can instantly add depth and dimension to your set-up. For trade shows, hanging signage - such as a banner - is simple. Choose from our 3" Pipe and Drape Valance Hanger -- shown on the left -- for up to 2 layers (a "double rod" backdrop system), or our 9" Double Valance Hanger -- shown on the right -- for up to 3 layers (a "triple rod" backdrop system)! Either model will work with any of our uprights, and only needs an open slot in the top of an upright. You don't need any tools to use these hangers! For a more robust drape layering system, our Double Backwall Hangers allow parallel drape support rods (crossbars) to go in up to 4 directions! Easy to set-up just by inserting the pin into the top of an Upright -- no tools required! It’s that simple! Unsure which type of hanger is best for your needs? 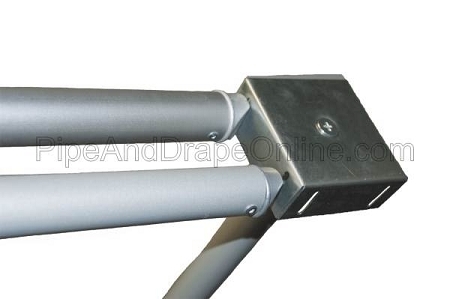 For any questions regarding our Pipe and Drape Valance Hangers, please don’t hesitate to contact us. We look forward to helping you!